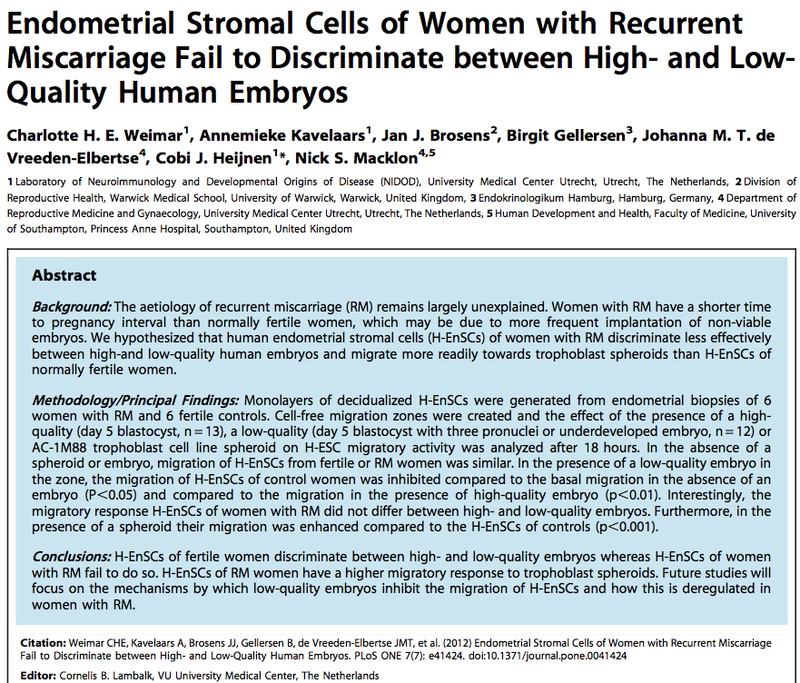 An important new paper has been published in relation to recurrent miscarriage (RM). Weimer et al have shown that there are differences in the migration patterns of endometrial stromal cells in women with and without a history of RM. In controls, the presence of a poor quality embryo was associated with inhibition of stromal migration. In women with a history of recurrent miscarriage this process seems to be deregulated and the endometrium is no longer able to discriminate between normal and abnormal embryos. This is an important finding. It may add evidence to the view that miscarriage may be dies to a failure to recognise an abnormal embryo – in effect a failure of a natural quality control mechanism. Hence women with RM become pregnant very easily as all embryos implant – but then many pregnancies end in miscarriage due to the higher number of implanted abnormal embryos. This entry was posted in Diagnosis and treatment, Media stories, New research, News and tagged early pregnancy, Miscarriage, recurrent miscarriage. Bookmark the permalink.